I have always liked to call Dandelions “the tramp with the golden head” and it is obvious why, for the stately Dandelion seems to follow humankind everywhere they go. These bright yellow flowered plants pop up in lawns, roadsides, field’s and forests and as much as we try to keep them out, they show up in our gardens too. Some old Eclectic herbalists would say that this is nature’s way of showing the community of people what they need for food and medicine. An extension of the Doctrine of Signatures philosophy basically states that plants resemble the body parts that they are healing for, and that plants that grow around us are the ones we need. Taraxacum officinale and Taraxacum erythrospermum are the Latin names for the common Dandelions. It is also known as Blow ball, Wild Endive, and ‘Lion’s Tooth’ which is from the French dent-de-lion. They are native to Eurasia and South America and these two species are found worldwide, and are completely edible in their entirety. “A weed is an herb whose value is not known or appreciated.” That is a fair place to start for a plant that is misunderstood and its use not taken advantage of. Since the 1700’s early explorers carried this plant to the new world because it was so valuable as a food source and used throughout most of the year. Dandelions are one of the first greens to pop up after a winter sleep in the ground and we can only imagine how excited the early settlers were to have fresh food after a long winter of stored items. 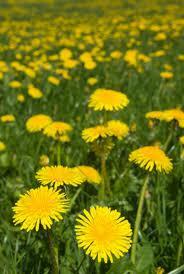 Let’s look at Dandelions historical uses and see this marvelous plant through the eyes of the early colonists. The highlight was the springtime when the first greens started to grow. The settlers would mix fresh spring leaves with cheese and vinegar for a delightful salad mix. This was a much needed source of vitamin C and a burst of fresh minerals and digestive support. The winter’s diet of salted, dried and sometimes spoiled, stored vegetables and grains was definitely lacking any sense of freshness and vitality. 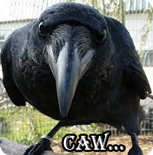 Scurvy was always a threat in those early days as well as stomach and digestive disorders. The best cure for this was a food that also stimulated the digestive and gastric fluids to flow and tone the stomach. It does this with dandelions natural bitter compounds. 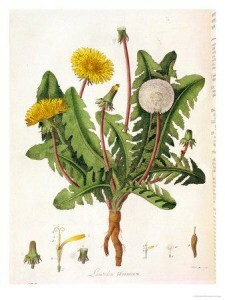 Dandelions also aid the liver to detoxify and cleanse, open the gall and bile ducts, increase all the natural secretions of the digestion organs as well as build the blood with cell salts and organic iron that help to thin the sluggish blood from all the saturated fats, eaten in excess throughout the winter. They used the technique of picking the leaves around the outside of the plants rosette; this would help the dandelions to continuously produce leaves for months. As the leaves grew larger in the summer, they could be boiled for 5 minutes and this would compare to our current day spinach. Had they only known of bananas, blenders and green smoothies, which by the way, is perhaps the best way to eat dandelions because you get their full potential of vitality and nutrient dense life force. In the early springtime the roots were also dug and because of the naturally sweet sugars and starches in the young roots, these would be added to soups and stews. Again their food was medicine as this not only would taste good but would be like a medicinal tea to purify the blood and cleanse the body. Alas the golden flowers appear and these were eaten just as they are, picked fresh and eaten like strawberries. They also knew that the white milky sap in the stems was very good to apply to all sorts of skin complaints, even warts. The adults knew that if they picked buckets of flowers and mixed the cooked down mash with sugar or honey, that wine or mead could be produced. Obviously alcoholic and I’m sure the early settlers only used this luscious yellow wine medicinally. Yeah right! Throughout the summertime there were always leaves and roots being dug for dehydration and storage for the coming months. Another way the roots were used was by slowly roasting them to give the tea a slightly coffee like flavor. As the winter months draw close, many roots were dug and placed in barrels to sprout leaves to enjoy in the early months of winter. Another way to preserve the roots was to line a barrel with sand and layer the roots in there while alternating with sand, being careful they do not touch. Amazingly enough, many root crops were stored in cellars this way with great success at having vegetables for months. It becomes pretty clear how valuable dandelions are as a food source and medicine even in today’s fast paced world. However with the toxicity of our environment, isn’t it even more amazing that dandelions happen to be one of the easiest to grow. They practically grow themselves if given a chance and a little water; it seems all they need is a crack in the sidewalk to be happy. So let’s see the Dandelion in a new light by looking at its past uses and thank our forefathers for bringing this plant to the Americas, so we all can still benefit by incorporating this truly phenomenal and marvelous plant into our lifestyles where the ‘weed?’ dandelion can give us both food and medicine.